Building online trust is huge, it's the digital equivalent to a smile or handshake before a deal is made. This is a great infographic to learn about building online trust with your users. Source Analysis: I always start out by analyzing who made the infographic and if they have any bias that would cause them to skew the readers thoughts. GoDaddy created this infographic. They are a giant in the web world, they get the biggest benefit just from more people buying domains and needing websites. Their goal for creating this is to give people information and be there to supply them with services. I don't think they have much bias here because their goal is just for more people to get websites, they just want to be looked at as a helping hand in someone's online business. First off, WOW... 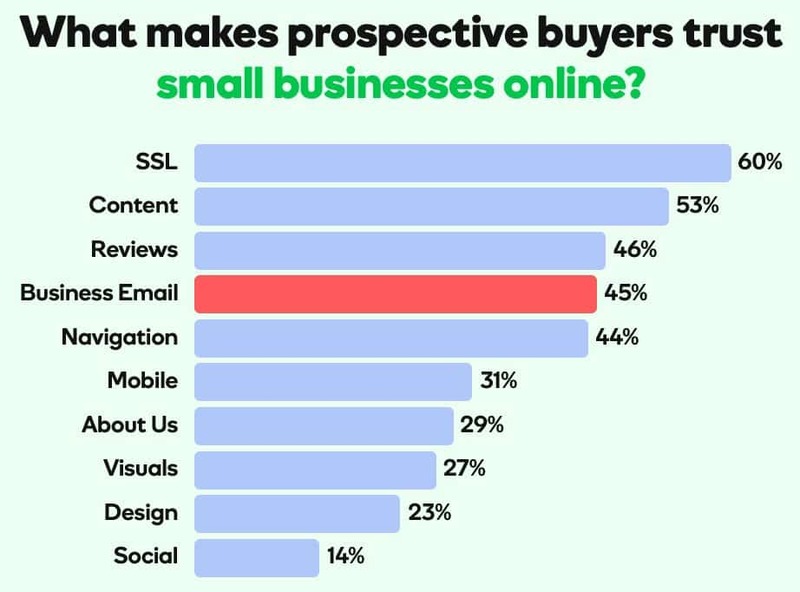 I did not expect some of these, but it's awesome to know that some of the standard website aspects that we implement at Grover Web Design are topping the importance list for online trust! SSL: This is one that shocked me, it's so easy to implement SSL. First off, just incase you don't know SSL is when your website address is https instead of http. It secures the data transferred between the website and the user viewing the website. On normal websites it's suggested, but on e-commerce websites it is a requirement! Contact us to secure your website with an SSL certificate. They are cheap, only about $10-20/month (depending on your website). This is a small price to pay for the #1 aspect to build online trust! Content/Reviews: I group these together because they are the aspects that you have the easiest control of and do not require a web developer. Adding content to your website should be technically easy, the issues most clients have are actually doing it and getting comfortable putting content out there. Reviews are also easy, just ask. It's that simple just ask some of your customers to give you reviews, they will do it! Business Email: This is another extremely important aspect that people don't usually handle properly. To be upfront, the original reason for this article was to promote GWD as your email guru. We handle email for many of our clients. It's a no-brainer. Google apps costs $5/user/month no matter if you set it up yourself or have us do it. We manage it for most of our clients and can solve any email issues in no time, don't try to do something yourself when a professional can do it at the same price! Mobile: Having a mobile friendly website is an absolute must these days. I am actually surprised that this one is not higher on the list. If you look at the fine print of the infographic, you will see it was created in February of 2016. This is pretty recent, but I bet now this will be much higher than 30%. At GWD, we make all of our websites responsive. We take huge pride in having the best websites on phones and tablets. They look great, are easy to navigate, and load fast! Wow,.. I didn’t expect SSL to be that important. Do you provide SSL certs for websites? I tried to set it up myself but, it was a nightmare. Yes, we do provide SSL certs for our customers, they cost $15/month and we handle all the setup, renewal, and uptime. Another important thing to remember when switching your site to SSL is to make sure all resources on the page are served from an HTTPS domain, if not your site will be in a “yellow” type of state when it comes to security… we will make sure you are fully “green” which makes customers the most comfortable. Ugh, I know I am supposed to add content regularly, but I never do it. Do you have any suggestions on how to get over writers block, eh it’s more how to create time to do it! Rich, you brought up the number 1 problem I have with most of my clients. They don’t have time to add content, it’s too important to delegate, and they don’t want to put anything out that isn’t perfect. Just do it! That is the best advise I can give. Start off small, just post a 1 paragraph blog post and move on. Personally, I’ve dealt with this, blogging (adding content) doesn’t directly make you money… but in the long run, it will be one of the greatest assets to your site and business. I took me a while, I committed to blogging and adding to social media. I didn’t see the fruits of my labor for a few months. I thought I was wasting my time, but then all off a sudden, I got one or two deals from it. Then, those deals gave me a new breath and focus. Now, our social and organic growth brings us 1-2 deals per month. Think about the long term implications of that, now do you want to add new content?! ?